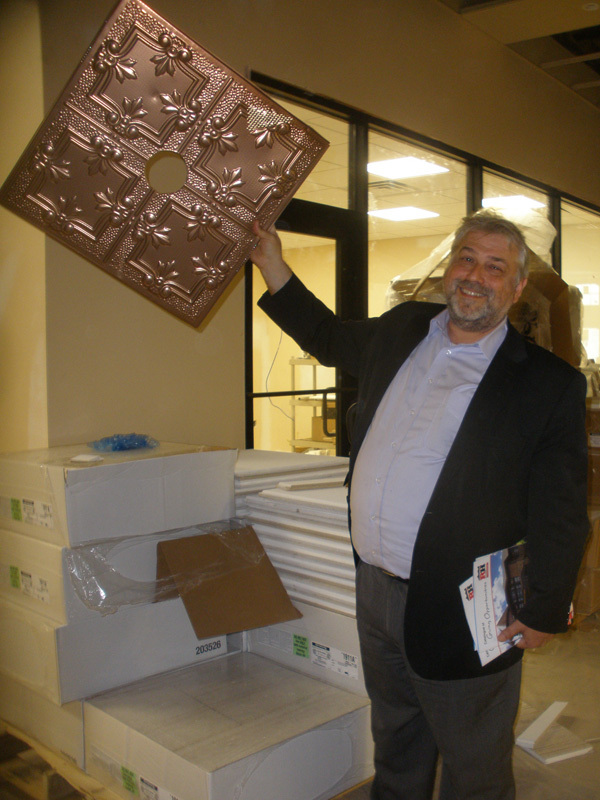 Rutgers Hillel executive director Andrew Getraer holds up a ceiling tile to be used in the new dining hall. Ten years after Rutgers Hillel launched efforts to erect its own building on the university’s main New Brunswick campus, the structure is nearing completion and is expected to be fully open for the spring semester. While the outside of the 40,000 square-foot Eva and Arie Halpern Hillel House on College Avenue is largely completed, a Sept. 22 visit revealed a team of workers busy inside engaged in a host of activities, including installing light fixtures, painting, grouting floors, and unpacking furniture. When fully operational, the facility will feature spaces where students can relax by a fireplace; study in individual cubicles; attend lectures and programs; and worship in spaces for Reform, Conservative, and Orthodox prayer services. There will be a rooftop Holocaust memorial garden, an office for Hillel’s Center for Israel Engagement, and a room equipped with a sleeper sofa and shower facilities for Shabbat-observant speakers who wish to stay over. Doors open to a pavilion that can be used for barbecues or cocktail receptions. One of the building’s highlights is a handwashing station along a wall of Jerusalem stone into which the ritual blessings have been etched in English, Hebrew, and transliteration. 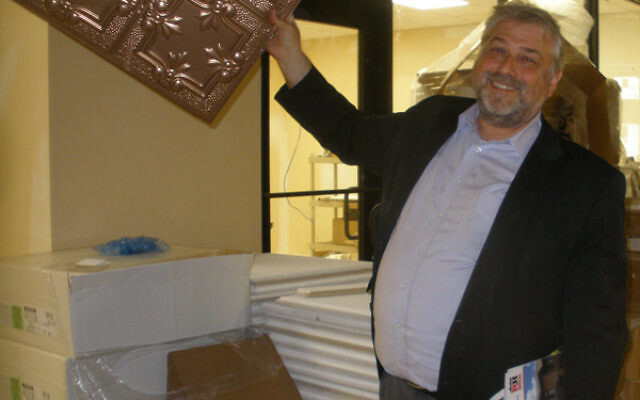 The Hillel will also house an outpost of The Orchid restaurant, which is renting the space to operate a dairy eatery open to the public to complement the meat restaurant it has operated in Metuchen for some years. Both will be under Star-K supervision. Originally set to open early in the fall 2015 semester, construction delays have pushed that back; now the first floor will open in November, the entire building in the beginning of spring, when a grand opening ceremony and celebration will be held. “Rutgers has one of the most successful Hillel groups in the country,” asserted Getraer as he sat in an unfinished office as workers stood on ladders behind him working on the ceiling. The $20 million building will share honors with the University of Wisconsin for being the largest Hillel facility in the country. According to Hillel International, Rutgers has the largest number of Jewish students of any university in the nation, with 6,400 undergraduates and more than 1,000 graduate students. The structure is at the epicenter of the $330 million College Avenue redevelopment, which includes the new School of Arts and Science building; an honors dorm; and “The Yard,” a university open space featuring a large video screen and eating establishments. “DEVCO” — the New Brunswick Development Corporation — “estimates that 8,000 students a day will walk by” the new Hillel, said Getraer. He previously credited DEVCO with “spearheading” a partnership between Hillel, the university, New Brunswick Theological Seminary, and the city that gave Hillel the opportunity to switch its original planned building site from the corner of Bishop Place and George Street, where a former fraternity house stood, to the current location. For 17 years, Hillel rented a small building — which has since been razed — several blocks down College Avenue from the seminary. It purchased the house and held a “demolition party” in November 2009 with plans to break ground a year later. However, the drive stalled in a tough fund-raising climate. The 2013 land swap with the university was termed by DEVCO president Christopher Paladino a “unique private-public partnership,” through which the project was awarded $33 million in tax credits by the New Jersey Economic Development Authority. That allowed Hillel to move forward and increase the size and scope of its new headquarters. Ground was broken in November 2014.